Think seriously about adding bar sinks, also known as prep sinks, to your kitchen. Here is a guide to why they can make your kitchen better than ever. Are you looking to do something different with your kitchen this year? Do you love to host parties and entertain large groups of guests all at once? Then these questions are both critical ones you need to answer. Then think seriously about adding bar sinks, also known as prep sinks, to your kitchen. 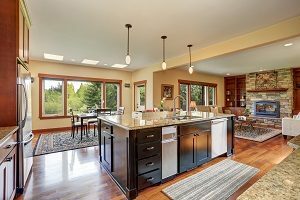 Here is a guide to why they can make your kitchen better than ever. First of all, having a bar sink or a prep sink in your kitchen adds convenience. This makes it easier to move heavy pots of water from where you fill it up to where you cook with it. Safety and convenience are two of the biggest benefits, but before adding bar sinks to your kitchen, think about how your kitchen is currently designed. Part of the reason you want to remodel it could be to open it up and make it easier to move around in. Have you ever been busy preparing a meal only to be frustrated by other members of your household who insist on standing in the kitchen or busy working on another task? You don’t need to let them get in your way anyway. By adding bar sinks, you can help control the flow of traffic in your home’s kitchen. Cooking is much faster, easier, and more fun when you can focus on it. However, at some point, you’re going to need some help in the kitchen. When multiple people work together to prepare a meal, or you task your partner with washing the dishes while you cook, both of you using the sink at once can become tedious. A second prep sink can allow someone else to help you cook with their station to help prepare the ingredients you need, especially if there is water involved. You might be wondering where the second sink in your kitchen can be installed. If you were thinking of adding an island, then that would be the perfect place. When you upgrade a conventional kitchen island to include a bar sink or prep sink, you can continue talking to your guests or family members normally while being able to continue cooking or cleaning the sink after you’ve finished using it. This entry was posted on Wednesday, January 30th, 2019 at 2:03 pm. Both comments and pings are currently closed.